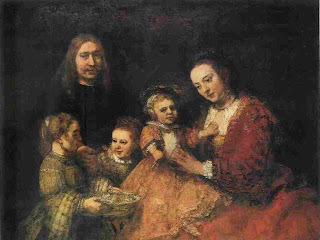 Rembrandt, "Portrait of a Family"
Last Sunday, I had a wonderful visit with Luke, Krissy, Kaylee, and little (well, not so little) Josh. Truthfully, those few hours were like a chapter out of some novel about the ideal family. I felt as comfortable and happy as I’ve ever felt among parents and children. I’m sure they have their share of problems (what family doesn’t? ), but what I saw Sunday was four people (even Josh) who have learned how to look past or through the problems to see and appreciate the rather amazing joys of family life. We sat in their living room, which had been barricaded into a totally safe “rumpus room” for energetic Josh. With pillows purposefully placed to block him from escape (and hurting himself), Josh sort of tumbled and tossed himself around the room as we talked and laughed. At one point he grew fatigued, which was a lucky stroke for me, because he snuggled down in my arms for a good five minutes and just breathed his deep baby breaths. Toward the end of my visit, Krissy, Luke, and I had a good talk about some personal matters, which only made me appreciate the strengths of family life all the more. We talked quietly for a good fifteen minutes, sharing opinions and suggestions, and when I left I took with me the youthful wisdom of this young couple. I also took with me a bundle of good feelings about how strong a family can be – one that works at it, anyway.